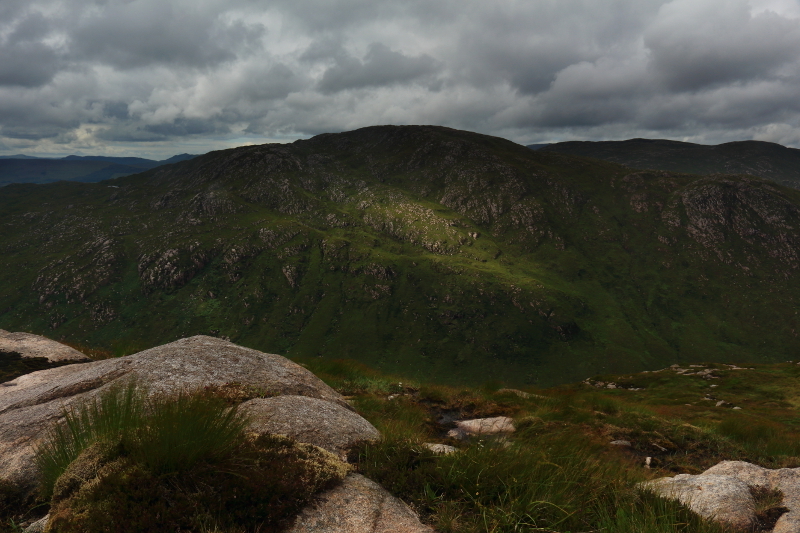 Erroneously marked on OS maps as Barnesmore, which is the name of the gap below. 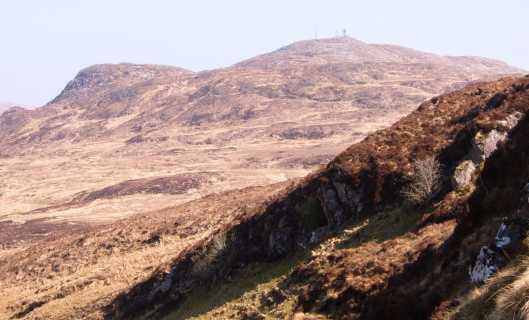 Cruach Eoghanach is the highest hill in the S Donegal/W Tyrone area and the 728th highest in Ireland. Access to Cruach Eoghanagh is from the N15 which cuts through the imposing Barnesmore Gap, dividing the higher Bluestacks from the smaller hills heading south. Started from carpark at 042872 A (plenty of spaces and tables for your picnic with majestic views). Dropped to cross a stream and cross some rough ground to a disused and overgrown quarry, climbed out of to the old dismantled railway track. Cross the fence and head upwards over deep tussocky grass which likes to hold onto water - gaiters to the rescue! - as skirt beside and above a small forestry plantation. A line of poles carrying power to the communications masts is a good guide towards the top. Stretching into the distance they brought to mind biblical epics such as Sparticus - with lines of men crucified. The strong easterly wind whistling through the power lines added to the image, sounding like the moans of tortured souls. Thankfully the ground becomes firmer and less demanding with height as rocks show their hand, having more resonance with the bigger Bluestacks to the north. This easier going was interrupted by a grouse flying up into the air not two feet from me, causing my heart rate to double in seconds. 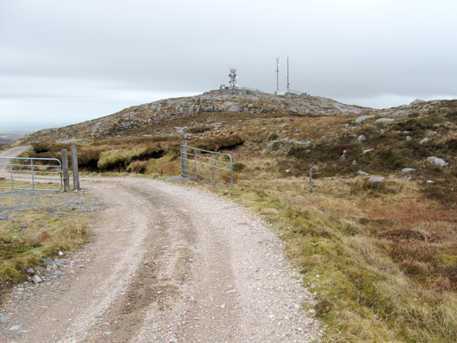 Croaghonagh (433m) is reached and gives clear views of the summit, a drop picks up the rough track serving the communication masts. A short walk on this track brings the top which is disappointing in terms of the intrusion of man - with the masts and associated rubbish detracting from the views. These are most dramatic to the N, across Barnesmore Gap to the height of Croaghconnellagh and the higher Bluestacks. The views S are over an area of bleak moorland, loughs and hills which has been touched by man by way of forest and wind turbines. I continued S to explore more of this bleak scape but an easy return would be to drop off to the SW and rejoin the dismantled railway track which could be followed back to he carpark. Anyone who's motored northwards from Donegal town to Ballybofey will have passed Cruach Eoghanach, known locally (if erroneously) as Barnesmore Hill. It's modest height belies a certain statuesqueness, particularly viewed from afar. 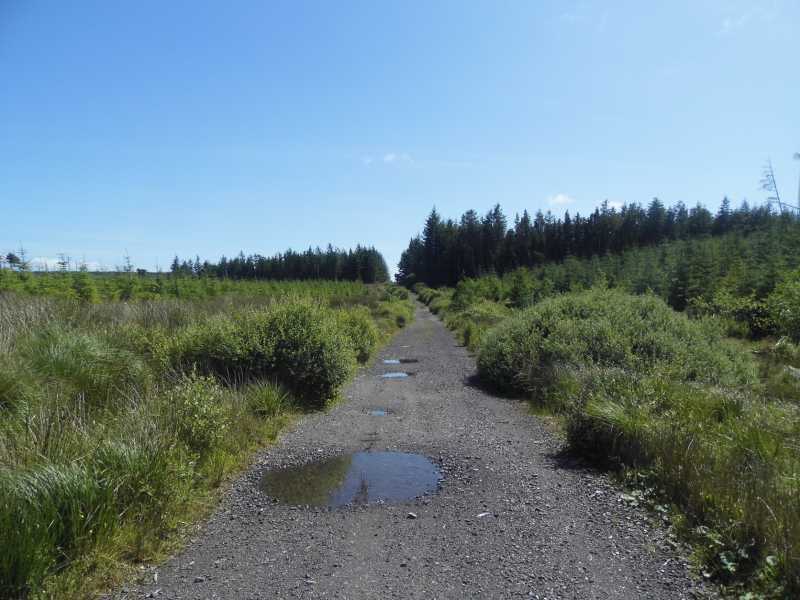 If approaching from Donegal town, drive through the Barnesmore Gap and keep an eye out for an unmarked gravel track on the RHS of the road (if you reach a side road signposted Castlederg, you've gone too far). Drive up this track for 0.2 miles and park beside a working quarry. The track to the summit starts at the gate to your right. The ascent is gradual to start, but steepens about half-way up (keep an eye out for a Coillte sign with a blue arrow, pointing the way). Tackled Croaghonagh today, parking in the carpark at the northeastern end of Barnes Gap, then doubling back a little to take the track leading to the quarry, before heading up the open hillside following the line of telegraph poles. The going was fairly hard as, although not very steep, the thick, long grass and heather was difficult to walk through. Near the top I met the access road leading to the communications masts on the summit, so I followed that the rest of the way up. Picture from TommyV : Track to the top. Picture: Track to the top.